Anti-communist government of Ukraine continues to attack Communist Party members. 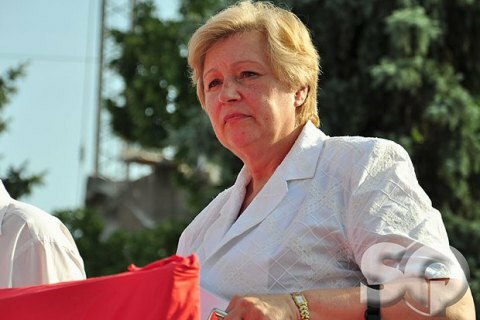 Former MP for the Communist Party of Ukraine (CPU) Alla Aleksandrovska has been detained on accusation of "bribing" and "separatism". Aleksandrovska's lawyer Oleksandr Shadrin confirmed the detention and noted that the detention is illegal because the relevant article of Criminal Procedural Code was not fulfilled. The Security Service of Ukraine (SBU) alleged that Aleksandrovska and her son attempted to bribe deputies of local councils in the south eastern Kharkiv region in order to ratify a "federalist" legal arrangement. SBU also alleged that CPU members works with the Russian intelligence FBS on the matter. Earlier, an opposition TV channel was forbidden after broadcasting a speech of CPU leader Petro Symonenko.